I’ve just put up a new SharePost on HealthCentral, where I write in the Bipolar Disorder topic. Living Well With Bipolar II Disorder: Taking Charge of Your Time talks about a change in my life I’m really proud of. It started in early November when I was talking with my son Joey via instant messenger. I can’t remember the details of the conversation, but it was probably me moaning about how overloaded and overwhelmed I was feeling. Something in our conversation inspired me that day (Joey’s good at inspiring), and I sat down with Microsoft Excel and created the schedule I wrote about in the SharePost. I’d lived too long, too often, in a slosh of struggle, anxiety and desperation. Always feeling overwhelmed, always feeling inadequate, always beating myself up. There were some periods where using daily lists really helped. I could go on that way for quite some time, as long as my mood wasn’t too bad and nothing went wrong. There were, and are, hypomanic periods where I had lots of energy, but I usually expend that energy on physical tasks like housework and gardening, not on work I get paid for. Face it – I don’t often get excited about working on my jobs. But they’re essential. They have to be tended. 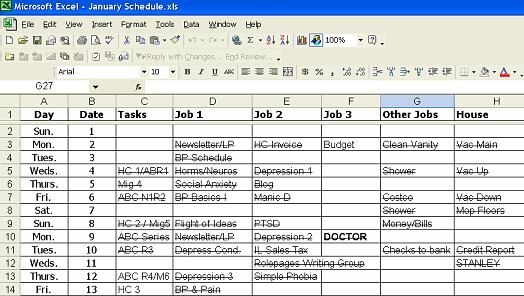 Anyway – when I started making a schedule for the month at the beginning of the month, complete with topics for my required writing, the effects were instantaneous and lasting. Wow! Pressure eased. Confidence increased. Work done, on time, without turning into a frantic ghoul clawing at my own spirit. Okay, so it’s only been three months – but I feel hopeful. What I’m doing incorporates many of the techniques I’ve found temporarily helpful in the past, all together. I don’t have to set it up every day, the way I did with daily lists, yet it helps me through the whole month. What would happen if my bipolar disorder decided to smack me with a severe depressive episode is anybody’s guess. I think using this monthly schedule would still help. Improvement is good. It’s been three months. Next month I’ll push to get physical. This entry was posted in Bipolar and Mental Health, Living and tagged living with bipolar 2 by Echo. Bookmark the permalink. I want to take charge of my life…but I keep falling on my face. I am starting to wear my emotions on my sleeve and I am going through an emotional roller coaster. As a teacher of middle schoolers…….which really I find rewarding….I find that I am failing them. I am on meds and have a therapist but the mood swings are getting so intense and so fast that I am loosing desire, communication skills, use of insight and intelligence; not to mention reasoning. The only thing that has truly helped is that I am involved with hippotherapy. I am not a complainer but I am reaching the end of my rope…suggestions??? I have tried a daily checklist with some successes. I read your post and thought I would share my story with you. I was diagnosed with BP I in January of 2009. I needed a way to record how I was doing as far as sleep, meds, mood, triggers, stressors, diet, exercise, symptoms, spending, etc. so I could manage my bp I diagnosis with my psychiatrist and psycologist. I found a tool called bStable from a company named McGraw Systems (www.mcgrawsystems.com) that helped me do exactly this. I record all of my information on how I’m doing each day and share that with my loved ones and doctors to have a transparent view with them into how I’m doing. My relationships have improved, I have not suffered a relapse and my meetings with my psychologist and psychiatrist are much more effective because I am able to send them ahead of my visits reports on how I’m doing. We focus when we meet on the critical areas of managing my disease state at our appointments. I highly recommend checking out bStable.